Leather has a certain newness and perfection that other materials just can’t replicate. When you first wear your new leather shoes friends compliment them, strangers ask where you got them and all is well. In the beginning you inspect them almost daily and keep them looking great. One day however after some time your shoes just don’t look the same, and that new leather glow has departed - it’s a sad shoe day indeed. Is it avoidable? And could you take better care of your leather and renew them with good care? We think so, and so armed with the proper care techniques and the essential do’s and don’ts you can look after your new leather shoes and keep them looking great. You may or may not know that most leathers already have an ‘extra-skin’ of protectant when you buy them. In fact leather should never be entirely dried out, it should be kept moist throughout its lifetime. This does not mean leather should be visibly wet, this will only stain your shoes in the long term and leave dark patches. Leather protector is designed to give an invisible layer of protection, but make sure you only apply it at recommended intervals. 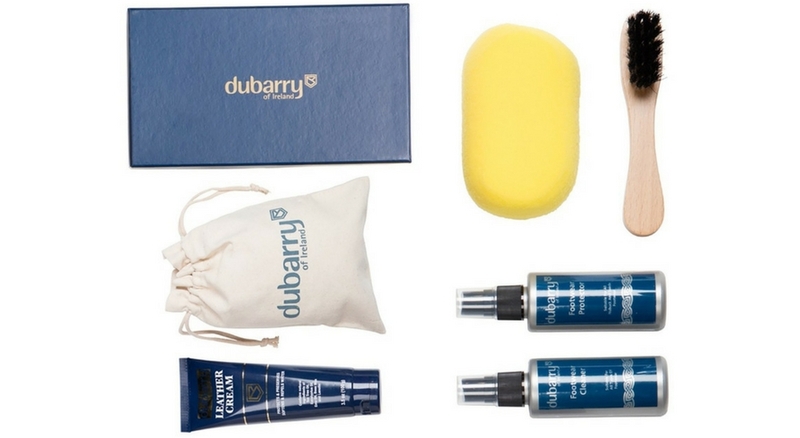 Dubarry have an excellent shoe protector kit, containing a quality sponge, protector spray and a hard brush. Given that leather has a layer of moisture and protection, they need to stored in a cool place. Room temperature is safe, but avoid cupboards near boilers or with heated pipes. When you discover your favourite dress shoes dried out in a dark space, it’s not a good look. The wrong temperature will also speed up the rate that stains sink into your shoes and belts. Over time your shoes will no doubt receive a small scuff or scrape as you go about your day to day business. If you store them on top of other shoes or next to doorways, you needn’t worry about the outside world, you’ll do all the damage at home. Instead, store your shoes in a wardrobe base, rack or beneath your bed if it’s clear. Piling shoes on top of each other or not giving them space is guaranteeing unnecessary damage. If your shoes begin to lose their shape, it can be difficult to correct but not impossible. Use a shoe tree to retain their form and avoid crease lines on the front of the shoes. Even sparkling clean shoes are brought down by lines and creases. A tree will apply pressure to the right parts of the shoe and ensure you avoid a loss of shape and discomfort. See the full range of Robinson’s shoe trees here. Boots like the Barker Harrison are made from the best cedar calf leather and are designed with comfort and durability in mind. To get the best from them over the years, you should regularly inspect them and keep them clean. Cleaning your boots isn’t just about ensuring they look good but it also affects longevity. Dried in dirt will stain and reduce the moisture on the outer layer. For a thorough clean always remove your laces before you begin, this avoids staining and scrapes. Clean with lukewarm water, always working from away from any stains in a circular motion. Avoid aggressive cleaning agents and check with the boot’s manufacturer on what is appropriate. Using brand polishes on your shoes is best practice, for example Barker polishes are made with their quality leather in mind. For more shoe care tips, offers and new product information follow us on Twitter. Also, let us see your polish work and leather care successes by tagging us on Instagram.